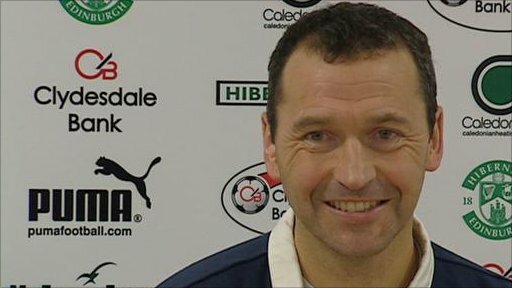 Colin Calderwood insists he would consider asking Hibernian to break their transfer record should the right player become available to the club. That record is £700,000 paid in 2001 to Liga Deportiva Universitaria de Quito for Equador defender Ulises de la Cruz. "I haven't been told they are not there," the Hibs boss said when asked if such resources were available. "If there was a player at that level, I am sure we could. That wouldn't stop me if that availability was about." Calderwood is poised to make his first signing should Nottingham Forest midfielder Matt Thornhill make his expected recovery from an ankle injury. With Hibs having failed to score in five games, a striker is viewed as a priority by many supporters, but Calderwood stressed that he was looking to improve the whole team. "We are looking at every area," he said. "We are looking at the short term, but we are also looking beyond this season. "Hopefully there will be one or two we can take in between now and the end of the season on a loan basis. "We have addressed all the areas because we have got to be secure, come February, that we have enough to get us results going forward and we have got to have an improvement in those results and give people a lift in the dressing-room." Calderwood stressed that he would like to retain the services of Derek Riordan, the forward who is out of contract in the summer and has been linked with a move to Burnley. The Hibs boss dismissed those reports and others suggesting that Swindon Town defender Jean-Francois Lescinel, who previously had a spell with Falkirk, was a target for the Edinburgh club. "There has been a conversation about him," said Calderwood. "The name was mentioned, as were probably 150 others, and it's an agent not doing his job properly. "It's been very busy and the first thing you do after a training session is pick up your phone and there's always one or two messages. "There's been lots of contact with agents, but a lot of it is pie in the sky." Calderwood, who took over from the sacked John Hughes on October, was far from relieved by the latest vote of confidence issued by the Easter Road board. Hibs chief executive Scott Lindsay last week reiterated the board's support for the manager who has now led Hibs to only two wins and 10 defeats in his 15 games in charge. Asked whether he was happy with the comments, the manager said: "Not particularly, no. "The only reason you're hearing it is because of the sequence of results. "I know exactly where I stand with the board. "I've got a good relationship with them. They understand and they're very helpful."